One-liner: Historically accurate, delightfully complex yarn full of wonderful imagery. 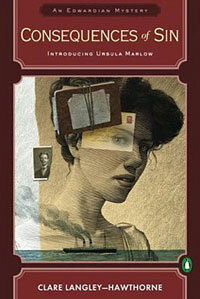 In Edwardian England Ursula Marlow is the only daughter of a widowed self-made man. She is woken one morning by a frantic phone call from one of her suffragette friends, Winifred “Freddie” Stanford-Jones, who has discovered her lover dead covered in blood in the bed beside her. Although she doesn’t want to be beholden to him, Ursula calls upon her father’s legal adviser Lord Wrotham to smooth the waters with the Police. Despite this Freddie is soon arrested and as Ursula tries to clear her friend’s name she discovers that the murder of Freddie’s lover may relate to a troubled expedition to Venezuela’s famed Orinoco Delta that her father financed 20 years previously. I love it when a book surprises me. I was expecting a frothy historical romp and although this book does have its frothy moments there’s also a more melancholic, even sombre, thread that I, perhaps perversely, enjoyed. Also, Ursula is also more complex and credible heroine than I anticipated. She’s not the over-the-top force of nature that Elizabeth Peters’ Amelia Peabody is but nor is she an Austen-esque woman constantly being overcome by the vapours. At times she’s a take-charge gal forging ahead regardless of danger but at other points she’s indecisive and clearly scared by unfolding events. This dichotomy is far more realistic than the extremes you often find in fiction and it made Ursula more interesting and the book less predictable than others in this crowded space. I’m no expert on the period but the historical setting seems to have been captured rather beautifully. There were many details of Edwardian life depicted that demonstrated that the past is indeed a foreign country: one fun to visit but nice to return home from. While exploring in South America a hundred years ago or sailing first-class on the Lusitania (5 years before it sank) might have been great experiences I wouldn’t trade them for being able to vote and look after my own finances. While I revelled in the details of the explorers of the past and Edwardian life in general there was a solid mystery playing out at decent pace although there weren’t many red herrings or alternative suspects whose guilt I could ponder. The remaining characters other than the two leads played fairly minor roles and but perhaps other characters will participate more fully in future books. The only one here that I struggled with was the policeman (in fact I’m still not sure if he was supposed to be incredibly dumb or vaguely corrupt). However the book was crammed with enough other delights to keep me occupied and I’ll even admit (as long as you promise not to tell anyone else) that I was quite engaged by the romantic element to the story (which was almost entirely lacking in soppiness thank heavens). This entry was posted in book review, Clare Langley-Hawthorne (Aus), England. Bookmark the permalink.